Located High on Dune Ridge, Watch Hill has commanding views of the Atlantic Ocean. Eleven out of our family of 15 visited the beautiful island of Bald Head Island for Thanksgiving, and could not have been happier with our choice of staying at Watch Hill. The house is beautifully decorated with all the comforts of home. We prepared a 15 pound turkey in the state of the art kitchen. As we dined at the dining table, we had an exquisite view of the sea which was breath taking. The bedrooms were very comfortable with a nice quality of bedding and bath. We had plenty of room in the house! There were 2 areas for relaxing and watching TV. The best part were all the porches on the front of the house. 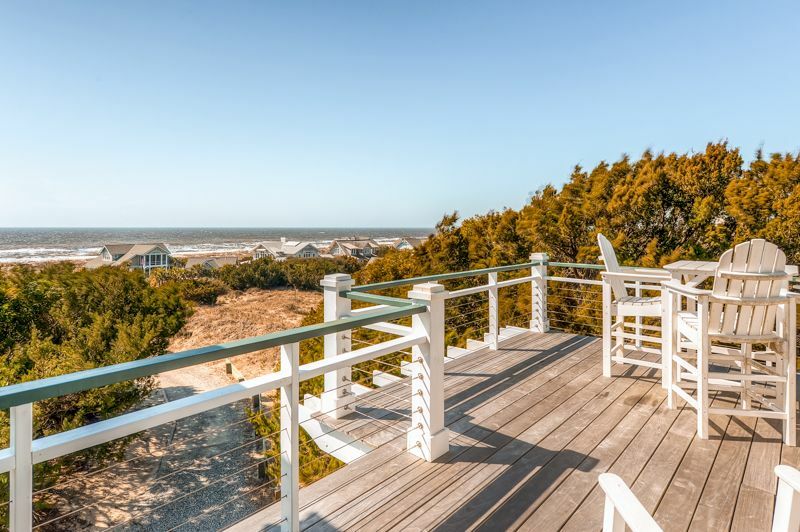 No matter where you are in the house, there is access to a beautiful view of the sea while rocking on the porch. We would stay at Watch Hill again in a minute! Great View, but the property is very run down. Watch Hill has an appropriate name. It has a commanding view from Frying Pan Shoals for 180 degrees to the mouth of the Cape Fear River. In addition it comes with an ample supply of golf carts (3) for larger groups. With that being said, Watch Hill is in serious need of repair. Before our arrival the refrigerator broke down and was still not functioning upon our departure, the sleeping quarters A/C unit went down for 4 days, outdoor furniture (amply shown in house photos) was either mildewed, torn or broken and a sound system that was non functional. Watch Hill is listed as a Premiere Property. The view is one of the best on the island, the rest has something to be desired.